Dealing with intoxicated veterinary patients can be difficult. There are few toxins for which there is an antidote. Often, the options available to the clinician are limited to supportive care while waiting for the toxic signs to abate. The recent development of another option in treating certain severe toxicities, intravenous lipid emulsion (ILE) is garnering attention. Proposed in the late 1990s, intravenous lipid emulsion (ILE) therapy was first used, with success, in the early 2000s to treat local anesthetic toxicity in humans. 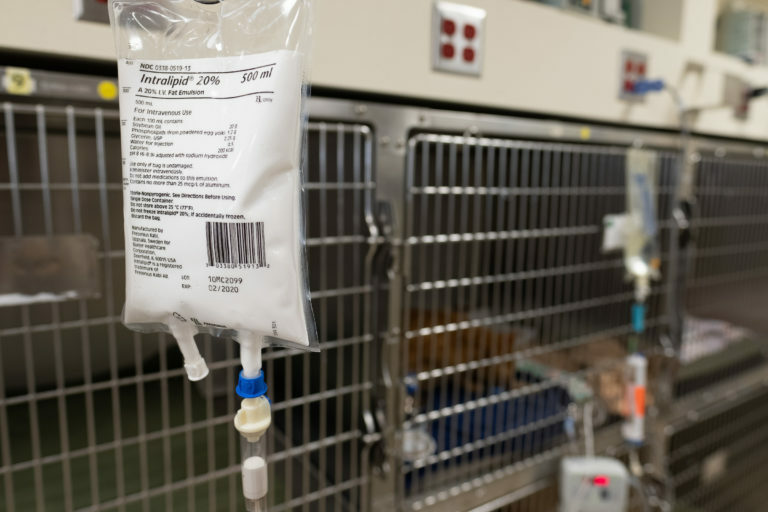 While local anesthetic toxicity appears rare in veterinary patients, treatment successes in humans led veterinarians to wonder if ILE might be helpful in treating veterinary patients with other toxicities, primarily when lipid-soluble toxins are suspected. Through case reports and one controlled study in veterinary patients, evidence is accumulating that ILE can be helpful in several common toxicities. Case studies and clinical experience have shown treatment responses ranging from subtle to dramatic, raising interest in using lipid therapy in severely intoxicated patients where standard therapies have failed. The potential success of ILE therapy depends upon the lipid solubility of the drug or toxin in question. ILE requires highly lipid-soluble toxins to provide a benefit. The mechanism of action is becoming more clear, though requires further study. Initially it was thought that lipids provided a “sink” into which lipid-soluble toxins could be partitioned, and thereby prevented from accumulating in target organs. Further work suggests a refinement of this concept, from “sink” to “shuttle”, where intravenous liposomes, having scavenged toxins from lipid-rich tissues such as the central nervous system, carry them to other organs where metabolism and elimination can occur. In humans with local anesthetic toxicity, a cardio-protective effect is also proposed. However, several of the toxins studied in veterinary medicine don’t feature cardiac toxicity, yet therapeutic benefit appears likely. In human medicine, ILE has been described mainly in the treatment of local anesthetic toxicity. There is one randomized controlled clinical trial evaluating the use of ILE in cats with permethrin toxicity. The clinical benefit was so obvious that statistical significance was reached early in the study, and the study was halted. There are case reports and case series describing ILE in the treatment of overdoses of avermectins and milbemycin, and a benefit in cats and dogs has been demonstrated. It’s important to note ILE therapy is not as helpful in dogs having a homozygous recessive ABCB-1Dgene mutation (formerly MDR-1). Smaller studies have evaluated the use of ILE in treating intoxications involving non-steroidal anti-inflammatories (i.e. naproxen and ibuprofen), baclofen, diltiazem, marijuana, synthetic cannabinoids, and tremorgenic mycotoxins in dogs. These studies have generally demonstrated a range of positive responses, from slight to dramatic. It’s important to keep in mind, however, that these studies are mainly case reports and case series, and should accordingly be viewed as preliminary information. In veterinary patients, ILE has been advocated in toxicities where the patient has shown inadequate response to standard therapies, or in substantial overdoses or exposure to a compound with potentially serious (e.g. life-threatening) consequences. Lipid emulsions are sterile mini-emulsions of oil in water. The oil component consists of neutral long-chain triglycerides or a mixture of medium- and long-chain triglycerides. Intralipid, the most commonly used product, and other currently available products (Liposyn and Nutrilipid), source the lipids by extraction from soya bean unsaturated fatty acids, though newer products featuring oils from olive, fish, safflower, and coconut have been described (though are not available in the US). Concentrations ranging from 10 to 30% have been evaluated. A 20% product is most well-described in the veterinary literature while a human study showed 10% emulsions provide insufficient effect and 30% provides more rapid recovery than 20%. Adverse reactions appear to be rare, and ILE administration is typically considered to have a favorable risk:benefit ratio in patients with severe intoxications insufficiently responsive to standard therapies or when the risk of toxicity is serious (e.g. potentially life-threatening). However, several categories of adverse events could occur: contamination, a reaction to components of the product, fluid overload, persistent gross lipidemia, and pancreatitis. Microbial contamination can result in phlebitis or systemic infection and can be avoided by following the manufacturer’s guidelines for storage and by maintaining sterile technique during administration. Allergic reaction to lipids or other compositional elements appears rare. If seen, signs could include fever, nausea, hypotension, and cardiovascular collapse. The volumes of ILE which are delivered over a fairly short period could potentially result in volume overload. If this is a concern, consider stopping other (concurrent) infusions or reduce the rate of administration. Persistent gross lipemia has been observed in patients receiving ILE, without obvious adverse consequences. However, there is a report of suspected reversible corneal lipidosis following ILE in a cat with permethrin toxicity. Pancreatitis may be a consequence of persistent hyperlipidemia. Hemolysis appears possible as well: though the risk is uncertain, poison information centers describe anecdotal information of a potential relationship. Lipid therapy should be avoided in situations where there is a known allergy to the components, hyperlipidemia, impaired fat metabolism/elimination, a bleeding tendency, hypokalemia, or hypophosphatemia. Dosing strategies in veterinary patients are based upon human protocols and the optimal dosage and administration strategy remains to be determined. This said, current protocols recommend starting with 1.5 ml/kg over 1-2 minutes, then following with a CRI delivering 0.25 ml/kg/min for 30 to 60 minutes. If there is risk of volume overload, consider stopping all other infusions or a reduced rate of 0.07 ml/kg/min for 4 hours. Lipid emulsions can be administered in a bolus and/or continuous rate infusion (CRI), and can be given through a peripheral catheter. Patients receiving ILE should be monitored for fever and allergic responses, particularly in the first 20 minutes of therapy. If there is no sign of adverse reaction, but the patient’s response is insufficient, dosing can be repeated once or twice, every 4-6 hours. Serum color should be monitored. Patients whose serum remains lipemic are not ready for a repeat dose. Exceeding 10-12 ml/kg over 30 minutes, or 16.5 ml/kg over 60 minutes, is not recommended. The FDA has established a maximum dose for 20% ILE in humans of 12.5 ml/kg over 24 hours for adults and 15 ml/kg over 24 hours in pediatric patients. Without a readily available antidote, treating intoxicated veterinary patients can be difficult. Lipid infusion provides a welcome option in cases involving a highly lipid-soluble toxin or drug. ILE therapy is relatively safe, cost-effective, easy to administer, and often of great value in promoting recovery of our patients. It is reasonable to look forward to more information on this emergency and interesting treatment option.